Ms Tsewang Dolma, the Information and International Relations Secretary of the TYC. (TibetanReview.net, Oct03, 2015) – The indefinite hunger-strike launched on Sep 10 in New Delhi by the Tibetan Youth Congress (TYC), a grassroots organization which campaigns for Tibet’s independence from Chinese occupation rule, saw one of the three strikers being taken to hospital by police on Oct 12. 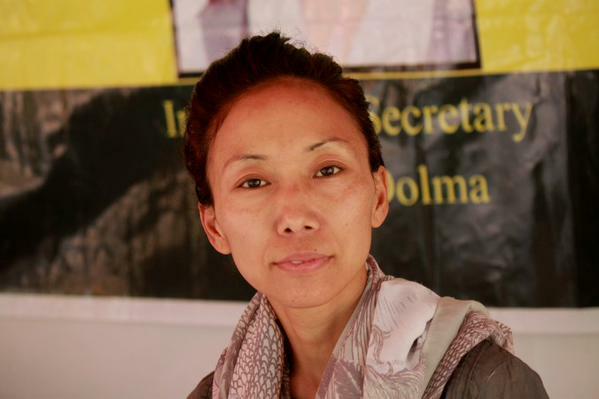 Ms Tsewang Dolma, the Information and International Relations Secretary of the TYC, had persistent stomach ache and severe dizziness when police forcibly took her to the nearby Ram Manohar Lohia Hospital. She was reported to have lost 20 percent of her body mass. Three executive members of the TYC began their hunger strike at Jantar Mantar to draw global attention to the tragic situation in Tibet after China celebrated on Sep 8 the 50th anniversary of its establishment of the so-called Tibet Autonomous Region. The other two are Vice President Mr Tamdin Hrichoe and Finance Secretary Mr Tenzin Wangchuk who both are said to have lost 14-15 kg each and to remain under close watch by Delhi Police. The TYC wants the UN to hold China accountable for its actions in Tibet, including by seeking to send a fact finding delegation to assess the situation in the territory. The hunger-strike is also meant to be an act of solidarity with the Tibetans in Tibet. The TYC had earlier sent memorandums to the United Nations representative office as well as various foreign embassies in New Delhi, drawing their attention and seeking their intervention on the ongoing tragedy in Chinese ruled Tibet. Following Tsewang Dolma’s forced hospitalization, it has expressed disappointment over the lack of action by the UN on the tragic situation in Tibet where more than 140 Tibetans had protested with self-immolations since Feb 2009.